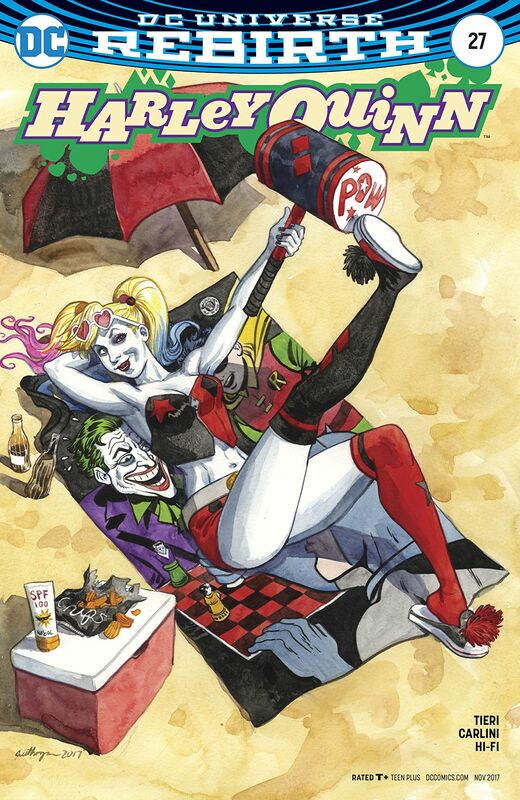 Harley Quinn #27 Review – AiPT! Did we really need this issue? In a lead-in to the awaited “Vote Harley” issues, our soon-to-be mayoral candidate learns about the pains caused by the sexiest of civil issues, eminent domain. Aww, yeah, son. Seizure of private property by the government for use by the greater good. Nothing like civil forfeiture based on a treatise from 1625 to really get the motor going. Turns out Penguin is back in Harley’s life, causing trouble by forcing various properties in Quinn’s Coney Island neighborhood to close and be sold to him all for his new Iceberg Casino. A lobster claw and intentional pun later, and Oswald Cobblepot knows exactly where the psychotic psychiatrist stands on the issue. Thwarted in her standard bat-to-the-face methods by roided-out murder penguins from S.T.A.R. labs of all places (trust me, you’ll have to see them to believe how far the team of Frank Tieri and Eleaonora Carlini take it), she resorts to the one constant in her and Penguin’s relationship: Mistah J. Or, a reasonable facsimile thereof. The best part about this issue is the Deadpool-style fourth wall break on the final page, featuring perennial author/artist team Amanda Conner and Jimmy Palmiotti. Join them in two weeks when things get back on track. It's pretty entertaining, but did it really need to be made? Calling your own creative team a pair of "Rat-Farts" is a new one on me. Was the schedule shuffled up? Did we really need this issue?